St Patrick's night at the White Horse in Haslemere. 8pm onwards - be there for the craic. from Thursday 21st to Sunday 24th September 2017. "A huge “Thank You” to you for your tireless efforts to get the sound right for us again at Grayshott Folk Club last night and for your playing and singing. I thoroughly enjoyed listening to The Charcoal Burners and to Low Lily, they both sounded great. It was a fitting way to end our season with both local and international musicians represented and it demonstrated that even in these challenging times, music has no barriers and has the ability to unify. The audience applause was as loud and generous as I’ve heard it in almost seven years of Grayshott Folk Club’s existence. What they may have lacked in numbers, they more than made up for with their clapping! Please pass on my thanks to Martin, Steve and Art. You’ve got a great band there and I hope you get the gigs you deserve after all your hard work. I also hope the new EP is well received and that you sell shed loads of them. Keep in touch and I hope to see you again soon". The Charcoal Burners are supporting Low Lily (www.lowlily.com) from Vermont on their UK tour at Grayshott Social Club (www.grayshottfolkclub.co.uk). Tickets £14 Call Des O'Byrne on 01428 607096 or on the door. A fantastic evening celebrating 60 years of Marley Flowers with 60 life sized hogs each sponsored by a business or local luminary and decorated by renowned artists, topped by The Charcoal Burners on stage performing an litany of catchy songs and tunes with the luminaries of the town, including the Mayor Sahran Abeysundara, who must be the most stylish and charismatic mayor in the country, dancing in the aisles. The Charcoal Burners appeared at The White Horse 22 High Street, Haslemere for a two hour set celebrating St Patrick's day. The Charcoal Burners performed at the launch of Haslemere Hogs at Barons BMW dealership, Hindhead Surrey which has sponsored full sized hogs to raise £12,000 for the Mayor's charities. 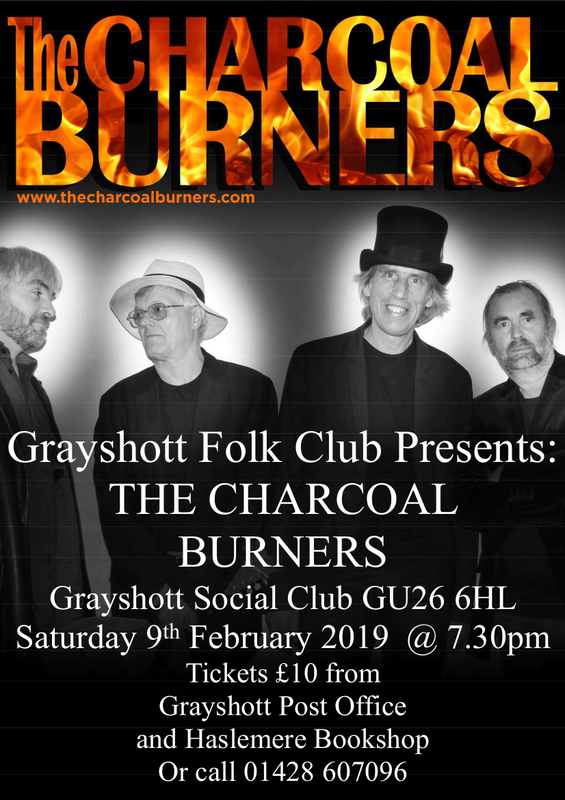 The Charcoal Burners stood in for Nuala Holan, who sadly had a back injury and couldn't make the gig, with a foot tapping 45min set supporting Kit Hawes and Aaron Catlow formally of Sheenanagig at one of the finest folk clubs in the South East: Grayshott Folk Club run by Des O'Byrne. Grayshott Folk Club has featured Altan, The Church Fitters and Caravan. A fantastic evening and packed. We'd recommend anyone going to a show here. Do check out Grayshott Folk Club's website below and contact Des for bookings for up and coming shows. Breabach, one of Scotland's finest folk bands are playing Sat 11th Feb 2017.